Several nations considered by activists to have poor human rights records have won election to the newly formed UN Human Rights Council. China, Cuba, Pakistan, Russia and Saudi Arabia were among 44 states confirmed on the 47-strong council, elected by the UN General Assembly. The new body replaces the Human Rights Commission, discredited for having members with terrible rights records. Three seats from eastern Europe will be allocated on Wednesday. Sixty-seven states stood for election. The US-based advocacy group Human Rights Watch had urged the UN not to elect China, Cuba, Pakistan, Russia and Saudi Arabia onto the new council. However, a spokesman for the group told the BBC that they had expected most of those five to win places because of their political power. Venezuela and Iran - also judged unsuitable - failed to win election. Azerbaijan faces defeat in the final round of voting. 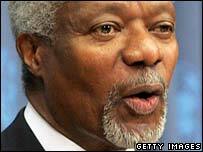 The disbanded Human Rights Commission numbered Sudan and Zimbabwe among its members. The BBC's Laura Trevelyan, at the UN, says the old commission was widely seen as a bad joke. Whether the new Human Rights Council really represents an improvement on the old Commission depends on how it acts from hereon in, she adds. Each nation standing for election has had to pledge to promote human rights. But campaigners hope it will be less politicised and more willing to act on abuse than its predecessor. Many recent commission members with poor human rights records did not stand for election, including Sudan, Zimbabwe, Syria, Nepal, Eritrea and Ethiopia. The creation of the Human Rights Council is seen as a key component of overall reform of the United Nations. However, the United States was against the council's creation, arguing that it did not go far enough to prevent countries with bad rights records from winning seats. US Ambassador John Bolton has said the US, which is not standing, will work with other member states "to make the council as strong and effective as it can be." The regional composition of the new council is based on population. 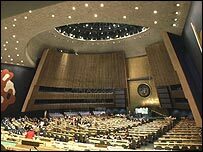 To get a seat a country must be elected by a majority vote of the 191-member General Assembly. The UN says on its website that "member states will take into consideration a candidate's contribution to the promotion and protection of human rights". The council will be based in Geneva and is expected to hold its first meeting on 19 June.